It has been my desire, since long, to start a sentence with the word – apropos. So here goes. Apropos the news article that appeared in The Telegraph, Calcutta edition, dated 22 February 2014 there is a whole world captured between innocuous quotation marks – a rather conspiring and risqué world. Special note; all punctuation marks in the excerpts from the news article reproduced below appeared in the newspaper. Emphases are not mine. Student beaten for ‘kissing’ in room. Our Correspondent. Feb 22: A first-year student of Burdwan Homeopathic College was allegedly assaulted by residents after they claimed they found him kissing a classmate in his rented home last night. …. Police sources said the girl had come to the boy’s room, which he shares with four other students, around 8 last night to “discuss studies”. The other boys were not in the room. Some of the neighbours said the boy and the girl, who hail from different states, were “caught kissing” in the room. “Some of the neighbours barged into the room and started assaulting the boy and abusing the girl. Five or six classmates who live in the neighbourhood rushed in and a scuffle broke out between them and the residents. The boy was slapped and punched” an officer said. Permit me to draw your attention to some of the quotation marks placed by The Telegraph’s correspondent; the girl visiting the boy to “discuss studies” when his roommates were not in the room or the last line in the article that refers to male and female students visiting each other’s homes to “exchange notes”. A rather dull story, buried in the newspaper, about assault on students and academic toil with notes being studiously exchanged instantly transforms into a salacious one. 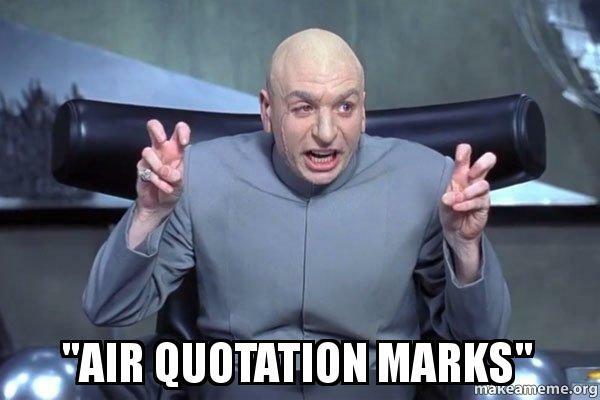 Quotation marks, unlike other punctuations, figure in verbal conversations – with the air quote – seen here, in the image of Dr. Evil (from the film Austin Powers). See how he raises his hands, fingers curled with two fingers peeking out pantomiming the quotation mark to emphasize a point or drip sarcasm. There are reports of some “esteemed” organizations wanting to do away with punctuation marks. They find it unnecessary and laborious. It complicates the English language, according to them. Punctuation marks have a grammatical job to do, but they do more than just that in the readers’ mind. In fact someone even has a blog, unnecessaryquotesdotcom, where quotation marks (intended or otherwise) provide a lot of mirth. If you a still not convinced, allow me to demonstrate it with this excercise, mentally insert air quotes when you sit through long, boring corporate presentations or when you hear a politician speak. I bet you can’t hide a chuckle when you discover the unseen world that lies “within”. ‹ Well, you don’t kindle my interest…almost. Good one PK… To stay with you vegetable au gratin analogy, Quotation marks is an easy and cheap way to convert a ‘veg’ meal into a ‘non-veg’ meal.